Perennial flowers are a garden mainstay. They are generally hardy, easy to grow and produce flowers in an elegant array of sizes and colors to suit most any gardening need. If height and blooming period are considerations, there are dwarf cultivars available of many perennials that will keep your garden alive with colorful blooms all summer long. With the new hybrids available, pinks can provide color all summer long. Called “pinks” because of their pink, rose or raspberry flowers, they require full sun and tolerate summer heat, humidity and drought. Encourage continuous blooms from late spring to early fall by deadheading flowers as they fade. Rising 4 to 10 inches above spreading mats of blue-green leaves, "D. gratianopolitanus" and "D. deltoides" are good choices when short cultivars are desired. Dianthus are a lovely choice for edgings, cottage gardens or in the front of borders. Similar in appearance to daisies, Gaillardias have brilliant, warm colors that make a vivid statement in the perennial flower garden. Undemanding and easy to care for, all they ask is full sun and average, well-drained soil. The stems begin to flop if given too much shade. In most cases, deadheading is not necessary for continual blooms, but it does make the plants look tidier. Blanket flowers bloom throughout the summer. For a short version, Goblin is a popular dwarf cultivar. Goblin blanket flowers grow 12 inches tall and have rich red petals tipped with yellow. Plant blanket flowers in the front of the perennial border, in rock gardens or in containers. Yarrows produce profuse yellow or golden flat-topped blooms from late spring to early fall. The foliage is gray-green, soft and fernlike. Hardy and durable, yarrows do best in full sun, with average, well-drained soil and are drought-tolerant. Where lower growth is desired, wooly yarrow (A. tomentosa) is a good choice. It grows about 6 inches tall and forms low mats of silvery-gray foliage with a velvety texture. Wooly yarrow makes a good plant for use in your rock garden or as a groundcover for small areas. 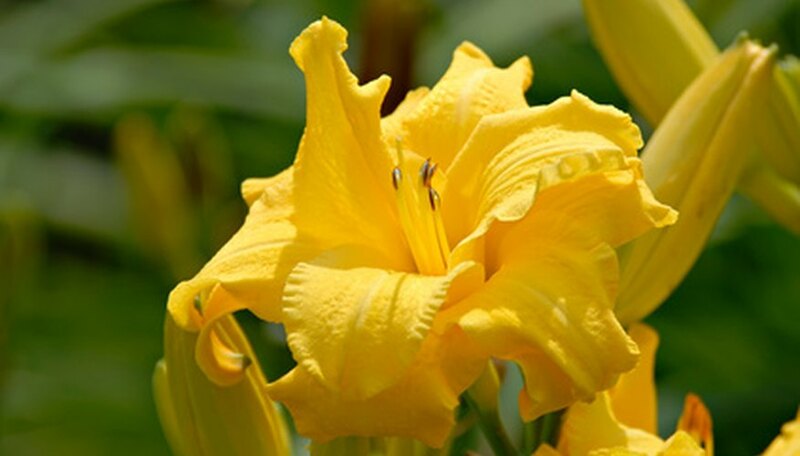 Daylilies are summer-blooming perennials whose individual blooms last only one day. However daylilies produce so prolifically that they provide a continuous succession of colorful blooms from early summer to fall. Daylilies do best in sun or partial shade, in average, well-drained soil. Dwarf cultivars are 12 inches or less in height with flowers in a rainbow of colors depending on the variety. Yellow "Stella Doro," red "Little Zinger" and pink "Little Delight" are popular options. Use dwarf daylilies as edgings, in the front of a flower border or massed in beds of their own.